I was thinking about the fact that no one in our generation seems to know how to knit. And that to me was so sad because I wanted to know how to knit! Plus, if no one learned then it could become a lost art. Then, after Christmas Break I came back to school and learned about several of my friends who had taken up knitting! I was so excited and immediately talked to my friend about teaching me. About a week later on a school trip she taught me to knit!! 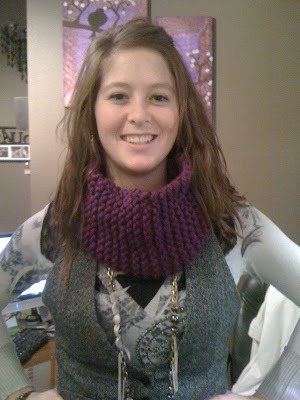 This was the first piece that I knitted! I like to call it a "Turtle. Neck-Warmer!" So now....I am working on a huge project! I know it is kind of adventurous, but that's why I like it! I have only just begun, and I know it will be a long process since I don't have a lot of time to just sit and knit, but I have started to make a BLANKET! I was inspired by seeing one that someone made and loving it! 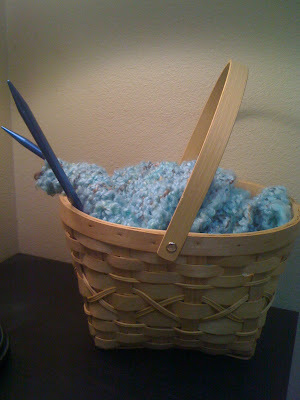 So I am carrying the beginning stages of my knitted blanket in my knitting basket!! I LOVE MY BASKET & MY PROJECT and cannot wait to finish it! Once I do finish it, I will definitely show you!